DIY Jewelry Making is not only dedicated to publishing jewelry tutorials. We also would like everyone to have access to our jewelry making magazine and experience what’s it’s like to learn how to make your own jewelry. Nowadays, almost everything is accessible on tablets and smartphones and through Apple Store and Google Playstore, you’ll get to see an array of jewelry tutorials, carefully created, chosen and compiled, aiming to teach all skill levels. 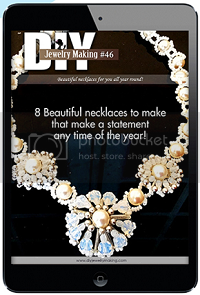 Join our club as we venture together into the art of jewelry making through DIY Jewelry Making Magazine on Apple and Google Playstore! Inside DIY Jewelry Making Magazine #46 are 8 jewelry making instructions tutorials on how to make necklaces. In creating these 8 necklace designs, you will learn Cubic Right Angle Weave, Netting Stitch, Kumihimo and basic wirework techniques. CLICK THE BANNER AND KNOW HOW!